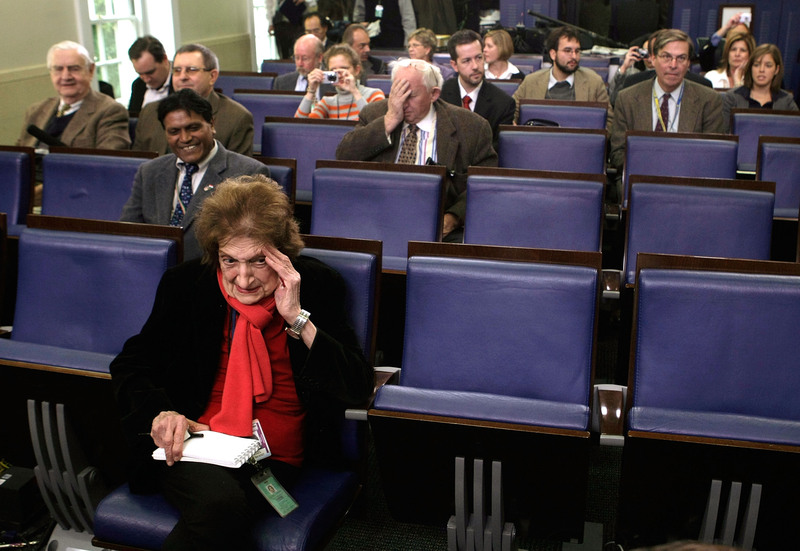 Helen Thomas — the journalist who often could be seen sitting in the front row at White House press conferences — has passed away at 92 years old. Thomas, who had been working the White House beat for almost 50 years, died following a long illness, according to sources. Having worked with United Press International and Hearst, Thomas was a member of the press corp until her retirement in 2010, and penned six books during her long career, including Front Row at the White House: My Life and Times, Thanks for the Memories Mr. President: Wit and Wisdom from the Front Row at the White House, and Watchdogs of Democracy? The Waning Washington Press Corps and How It Has Failed the Public. Thomas was indeed a trailblazer during her career, having served as the White House Correspondents' Association and Washington's Gridiron Club's first female president. Thomas also gained a reputation as one of the press corps' toughest journalists, having questioned, among others, George W. Bush on 9/11 prevention and the war in Iraq and President Obama's press secretary Robert Gibbs on health care reform. In fact, Thomas was most well-known — and beloved — by politicians and journalists as the member of the press corp allowed to ask the first question at briefings (thanks to her seniority), until a scandal forced her into retirement. In 2010, Thomas was filmed saying Israel should "get the hell out of Palestine" and "go home" to Poland, Germany, or "America and everywhere else." Continued Thomas, "Why push people out of there who have lived there for centuries?" After a negative reaction to her words, Thomas resigned from her post in the White House press corps, and released a statement saying her words "do not reflect my heart-felt belief that peace will come to the Middle East only when all parties recognize the need for mutual respect and tolerance. May that day come soon." Following her passing, though, many would like to remember Thomas as the iconic journalist who was always welcome in the White House's front row. In fact, during Obama's first press briefing in 2009, even he felt honored to be standing in front of Thomas. Said Obama in his first words to press, "Helen. I'm excited, this is my inaugural moment."